If you need an attractive low growing plant to use as a Border to conceal the scrappily base of rosebushes or to mask the water faucet on the side of your house, try oxalis. Or if you’ve a narrow park-way too difficult to mow easily or an area underneath an air vent in a house wall, oxalis will meet this requirement easily: All it, asks is some shade, though it will grow happily in full sun. Its clover like foliage never gets higher than 12 or 14 inches. The lush density of its leaves makes it likable for ground­cover, border, or concealment: It hangs attractively in hanging baskets and wall brackets, and it’s a sure-free success for winter bloom. Its versatility makes it attractive also in rock gardens. In sunny windows, the long-stemmed flower clusters will open about ten o’clock in the morning and close toward evening. Each blossom reopens for several days before it withers and drops off. The same bulbs will bloom for several years if they are rested in the summer and potted again in the autumn. Plant new bulbs promptly; exposure to air is detrimental. Farm people might mistake it for wood sorrel, which grows so freely out of doors. They belong toe the same family but oxalis originated as a greenhouse growth where it was used for its decorative qualities. Oxalis will not take too low a temperature and for that reason cannot be considered a perennial in many areas. In California it is grown in the open and sands fairly low temperatures. Whether you grow this plant from seed or rootstock or tubers, start them in the spring, if you are going to grow them out of doors: They require an acid soil and they should be kept well watered. Mixed loam, sand, and leaf mold make a good soil prescription for them. Given some shade they will grow taller in leaf and larger in flower. They give color for many weeks. Because they increase easily and bloom year after year you can get a, good start from just-a small supply. If you pot-plant from bulbs, plant them 1 inch deep. In locations where the foliage dies, the rootstocks may be put aside and dried out until the following autumn when sun and water make them active again. 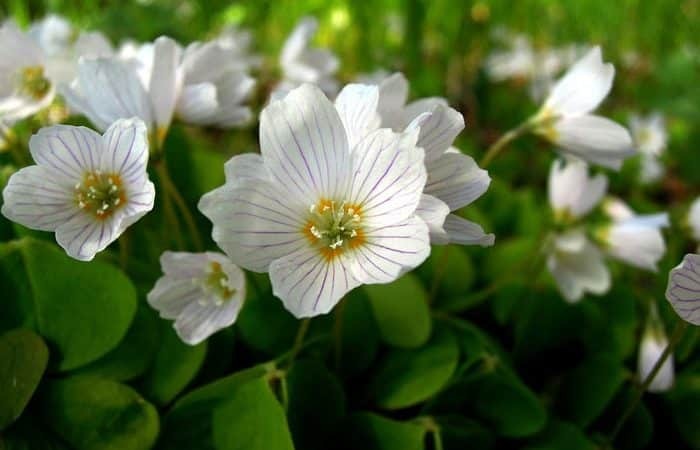 Among the species that are hardy, the commonest one is the native one known as wood sorrel, useful in rock gardens and for naturalizing as groundcover. On the West Coast O. oregano is used as a groundcover in shady places and covers itself with a rose-shaded flower. Also useful for the rock garden with rose-red -and lilac flowers are O. bowieana and O. rubra. With its rose-red 5 petaled flower above its cone-shaped tube, O. bowieana will continue to bloom all summer in a compatible rock-garden setting, and it’s extremely effective planted with gray plants such as dusty miller or against gray stonewalls.